EVERY YEAR we introduce hundreds of people to new film releases and exciting activities, all in support of the native salmon of the Pacific Northwest. 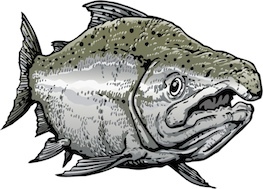 The Salmon Film Festival is co-sponsored by the Salmon Restoration Association, the City of Fort Bragg, and the North Coast Brewing Company. The City of Ft. Bragg includes Noyo Harbor, the site of the annual salmon barbeque and the main port for Mendocino County. Noyo Harbor has long been a key ecological and cultural resource, and a center of salmon recreational and commercial fishing. Recent declines in Pacific Northwest salmon populations have not only severely endangered salmon species, but they have also endangered hundreds of other species and habitats connected to the salmon, including humans. Coastal economies and cultures have suffered. The entire Northern Coast of California is home to tribes and tribal communities for millenia, many who consider themselves “salmon nations” or “people of the salmon.” Once-vibrant harbors and fishing-related businesses are much reduced, and consumers are often unable to tell the difference between wild-caught salmon and farmed salmon. Our Salmon Film Festival aims to help revitalize salmon awareness and salmon habitat, and contribute positively to salmon-based economies and cultures. We are a family-friendly event! Please, no dogs except service dogs. We serve food and drink throughout the festival. Even if you lose your festival pass, as long as we have your name at the door you can get in at any time during the festival. If you purchased a one-session pass, and decide to stay longer, you can easily upgrade to a festival pass with a donation. We don’t turn anyone away for lack of funds. We welcome you to show up, and just make a donation in the box at the front entrance. The festival organizer is Dr. Jeanine Pfeiffer, a Boonville resident, San Jose State University professor, and consultant to the County of Mendocino and native tribes and tribal communities.